There's 14 comments so far. Last comment was posted 10 hours, 40 minutes ago. I must admit this up front. 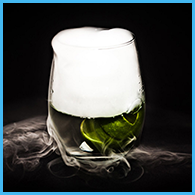 I struggled with the tiki gods to not include a warm and most likely flaming tiki drink in this month’s edition of Mixology Monday, Winter Warmers, hosted by our friends over at Imbibe Unfiltered. I was even playing around with how to photograph the blue flames dancing from my spoon to the glass, but I forced myself to look elsewhere. (Don’t worry, intense pictures of fire will grace the pages of Kaiser Penguin soon!). After an exhausting summer of tiki creation, I was up for simple fare as the cold weather strolled in. I had mostly been enjoying our wonderful Chairman’s choices of wine and sipping some of my favorite winter spirits: Chartreuse, Pernod, and Fernet Branca, but such delights soon gave way to cocktail creation. Just as my arms ached for a properly shaken drink, my fingers cringed at the thought of many icy Ramos Gin Fizzes. The new cocktails started coming in a flurry, and I couldn’t stop the grip that Festivon had upon me. I think one of the reasons I really like Chartreuse at Christmas time is the color. I originally thought it was all the alpine herbs I so joyously inhaled, but maybe it’s just that bright green hue that lured me in. You know, when I chose the Negroni for this edition of MxMo, I was thinking about how the orange aroma reminded me of holiday baking and how the bitterness warmed my soul. On second thought, maybe I just chose it because it’s red. 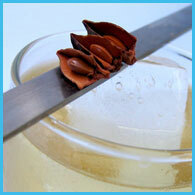 Stir with crushed ice, and strain into a rocks glass. Squeeze the orange peel (with or without flame) to release its oils. 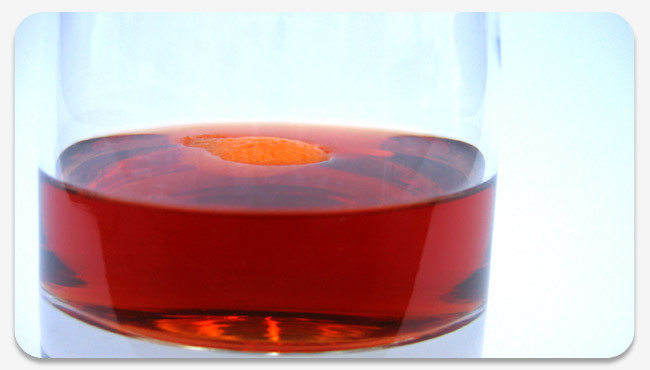 One of my favorite aspects of the Negroni is how wonderfully the orange aroma comes through as you sip. The dry finish is very welcoming and leaves a hint of orange and campari that tingle the roof of your mouth. Uhhhh – Campari; I’m convinced it’s what the Devil drinks. I just can’t get past it’s bitterness. This drink is actually kind of interesting – strange how it’s sweet while in your mouth, but then that bitterness takes over after swallowing. It actually tasted better the longer I drank it. Probably the best use of Campari I’ve tried, but I wouldn’t ask for it in a bar. Still looking for a way to get rid of that big bottle of Campari. If you don’t like Campari, you’d hate Fernet Branca. I really like intense and interesting flavors, but I used to hate licorice flavored drinks (including those containing pastis). I now love it, though. How? I sipped Pernod everyday for a month. Try it with campari if you dare. Well, I love Pernod but I’m not usually a big fan of orange-flavored drinks. I do like bitter drinks, though, so the Negroni sounds appealing. I’ll have to try one next time I have the opportunity. Marie Brizzard Cassis de Bordeaux (pretty sure thats the name of it) is supposed to be one of the better Cassis liqueurs out there, and it’s only about $17 or so where I’ve seen it. With as little as cassis is used thats not a bad deal. I’ve been planning on picking some up to replace the ho-hum DeKuyper brand I currently have, I’ll let you know how it is. Thanks for the tip Andy. I’ve had an increasingly hard time finding Marie Brizard products in PA, and I’ve heard that others are experiencing the same in other states. Is Marie Brizard having troubles? Is there anyone else who produces such a fine array of quality liqueurs? I have an email into one of their distributors to find out what’s going on. I’ll report back if I hear anything. I picked up a 375 ml bottle of “Mathilde” brand Cassis recently when it was on sale at BevMo (probably not available in PA, sadly). Seems like good stuff to me, although I think most of it will go into my flatmate’s champagne glass since there aren’t too many cocktails that use it. I’ve never seen the Vic’s Singapore Sling recipe using Cassis, I guess I’ll have to Google that and give it a try. I can now report that Marie Brizzard Cassis de Bordeaux is absolutely wonderful, much richer and smoother than the DeKuyper I was previously using. Accept no substitutes! Thanks for the comment! I haven’t heard back from the Marie Brizard distributor, but I’ll be sure to report when I do. Negroni’s are great; but you should add a few drops of Orange Bitters to the recipe. I do love a Negroni. But in winter, I’ve found mixing it on rum (substituting for gin, short the sweet vermouth a little), creates a sweet warmth. it’s actually quite popular in italy… by the way, did you know that a 1 lt. bottle of campari sells for about the equal of $10 USD? here they are almost $30! oh, the madness. I like the cocktail! Its very good! I shared the same comment as Ouroboros when he said: “I do love a Negroni. But in winter, I’ve found mixing it on rum (substituting for gin, short the sweet vermouth a little), creates a sweet warmth. This really enticed me to give it a try this winter. Thanks for the information.